Opened in 1993 following a six-year fundraising and lobbying effort by the citizens of Thurston County, the depot is operated by volunteers who meet every train and assist passengers. 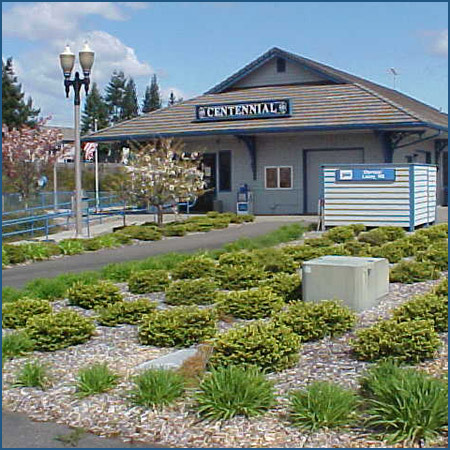 The Centennial station at Lacey, a suburb of Olympia, was built in 1992 by the Amtrak Depot Committee and designed by architect Harold E. Dalke who donated his work. It is designed in a style reminiscent of an early 20th century station. It opened in 1993 following a six-year fundraising and lobbying effort by the citizens of Thurston County. The station is operated by volunteers under the direction of the Amtrak Depot Committee. This dedicated group staffs the station for all trains, assists passengers with ground transportation, assists elderly and disabled patrons with train boarding and luggage, answers questions and resolves problems for travelers. A Thurston County Sherriff’s Office is also housed in the station. During the 1970s and 1980s, Amtrak passengers used a wooden shelter at East Olympia; however this location was remote, had no public transportation, poor parking, and no facilities. The Amtrak Depot Committee formed in 1987 to search for a new place for the station, and was successful in having Thurston County donate a four-acre site. The access road, parking lot, and platform were paid for by a grant from the state of Washington. The station building was constructed using funds donated by private individuals and companies through the sale of engraved bricks and tiles. Construction also made use of donated labor and services. Approximately $100,000 was raised in cash and $300,000 in products and services. Washington State provided $60,000 in additional funds to install utilities after the building was completed. The wooden facility is 2,800 square feet, and though designed in the manner of a classic railway station, the Centennial Station features modern electronics and airline-style information signage, and monitors the platform and parking facility with video surveillance. It also features energy-conserving construction. The decorative corbels under the eaves, which were obtained from New Orleans, are 150-years old and made of solid cypress. The area that would become Olympia is situated at the southernmost tip of Puget Sound on Budd Inlet. The abundant shellfish on the tidal flats and the salmon-spawning streams entering the Sound there had made it a favorite fishing spot for the native people. The site was first charted by Europeans in 1792 by Peter Puget and a crew from the British Vancouver Expedition. The Hudson Bay Company, a major force in the early settlement of the area, established Fort Nisqually, a trading post, on Sequalitchew Creek in 1833. French missionaries, at the request of the Hudson Bay Company, established the Mission St. Joseph of Newmarket and school in the 1840s at a time when the first American settlers were coming to what became the Oregon Territories. In 1852, Olympia became the county seat of Thurston County. The Northern Pacific Railway unexpectedly bypassed Olympia in its choice of Tacoma as a western terminus in 1873. Olympia residents built their own connection to the main line at Tenino, which was its only connection until the Northern Pacific built its own spur to Olympia in 1891. Olympia became the state capital when Washington gained statehood in 1889. Aside from government, the city’s primary economy has been based on timber, oystering, sawmilling, food canning and other related concerns. It also served as a shipping port for materials produced locally. Since the 1960s, Olympia has lost much of its waterfront industrial business, including the lumber and plywood mills, shipbuilding and power pole manufacturing, and the waterfront has undergone a gradual process of gentrification. Lacey is a suburb of Olympia and to some extent Tacoma, consolidated from the settlements of Woodland and Chambers in the 1950s, and incorporated in 1966. Amtrak provides neither ticketing or baggage services at this facility, which is served by 10 daily trains. The Amtrak Cascades are primarily financed through funds made available by the Washington State Department of Transportation and the Oregon Department of Transportation.